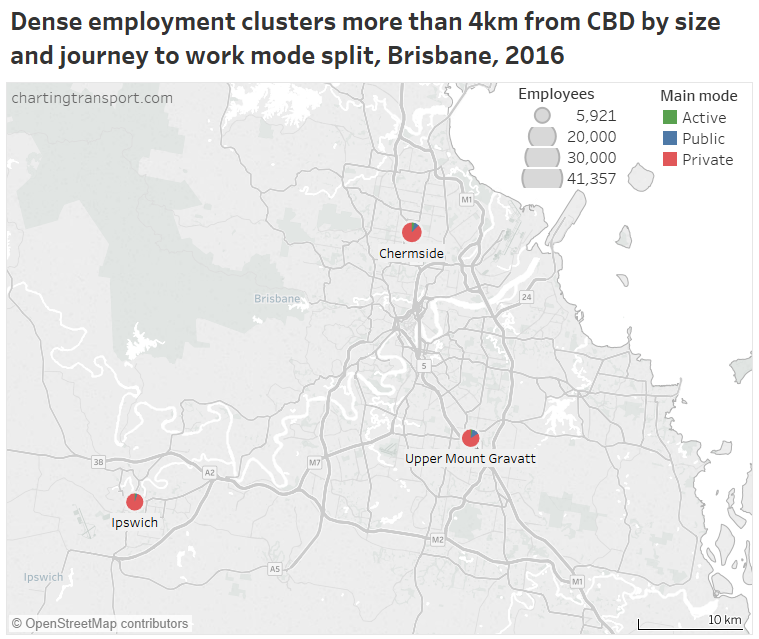 This entry was posted on Sunday, July 8th, 2018 at 11:39 pm and is filed under Australian Cities, Brisbane, Employment density, Melbourne, Mode share, Mode shift, Sydney, Transport Design, Urban Planning. You can follow any responses to this entry through the RSS 2.0 feed. You can leave a response, or trackback from your own site. Excellent post as always Chris. A bit of additional commentary about Dandenong South – in a lot of the industrial areas there aren’t any footpaths, so you get off a bus into a puddle of mud, or onto a laughably positioned concrete bus stop surrounded by puddles of mud. Also many intersections don’t have pedestrian lights so either your trip to work or your trip home involves playing chicken with semis doing 80+km/h. Every time I take the Dandenong South smartbus (admittedly not that often and never in peak time) I notice its very low patronage and the proportion of people who have no other transport options (eg elderly, mobility impaired, etc). Insufficient footpaths and pedestrian crossings certainly make and area harder for pedestrians and thus PT users and should be rectified. 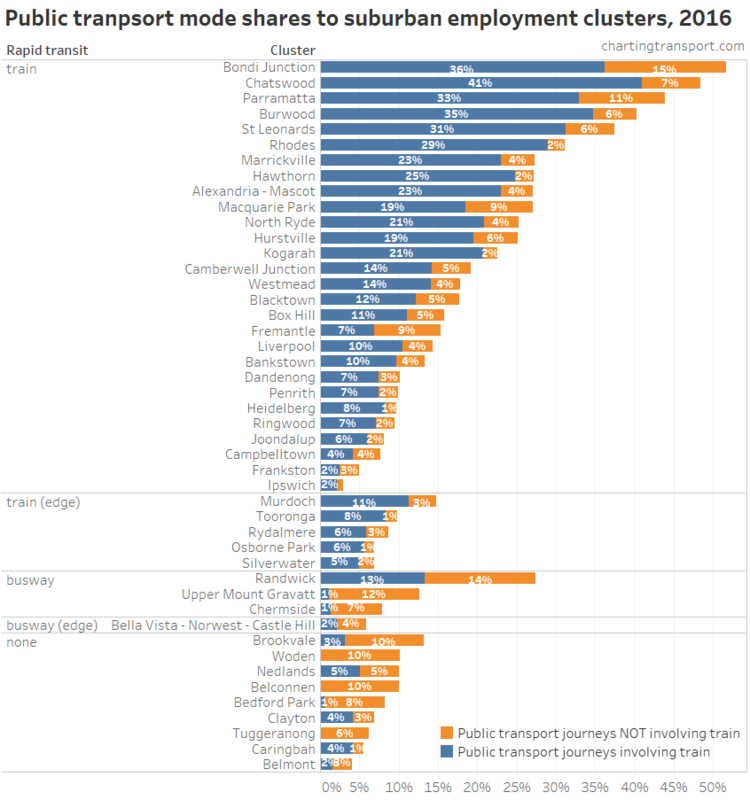 Another reason that Dandenong South has such poor PT usage rates is that it does not have a station on the Cranbourne line, which would likely attract hundreds of commuters a day away from their cars if done properly. Thanks again Chris for the detailed analysis. 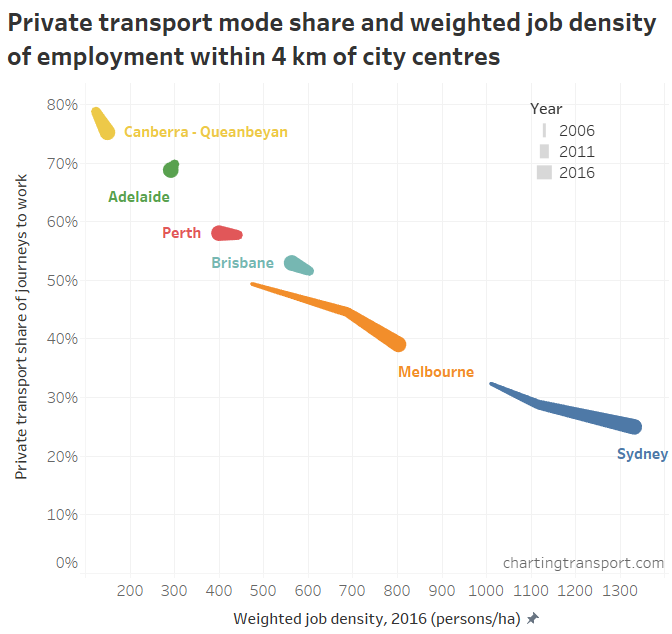 If I could elaborate on the point about job density and car mode share, you’ve found that the negative correlation between the two is strong, but not strong enough to suppress growth in car density with job density except at the very high end. I think there might be an interesting story here about the way expectations of employee car dependence drive job density (rather than the other way around). 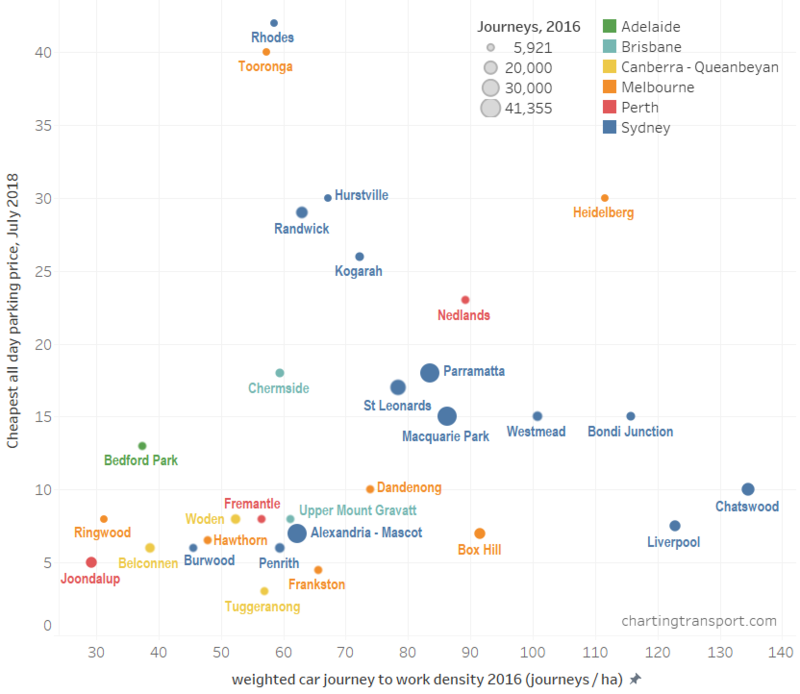 It’s not so much that there’s a hard limit on job density imposed by the need to provide car parking, as that different forms of car parking provision have very different costs and so impose different kinds of economic constraint. The cheapest form of car parking provision by far is with surface parking lots, and you see this in cities and parts of cities designed with a high level of car dependence in mind; this certainly does put a hard limit on job density given how land-hungry this approach is (and a corollary is it’s only possible in those cities or suburbs where land is relatively cheap). At higher job densities, the only way to sustain relatively high car mode shares is with multi-level parking structures, which are an order of magnitude more expensive. So one has to appeal to economies of scale and/or extraordinary public benefit (e.g. at hospitals) to justify the added cost. 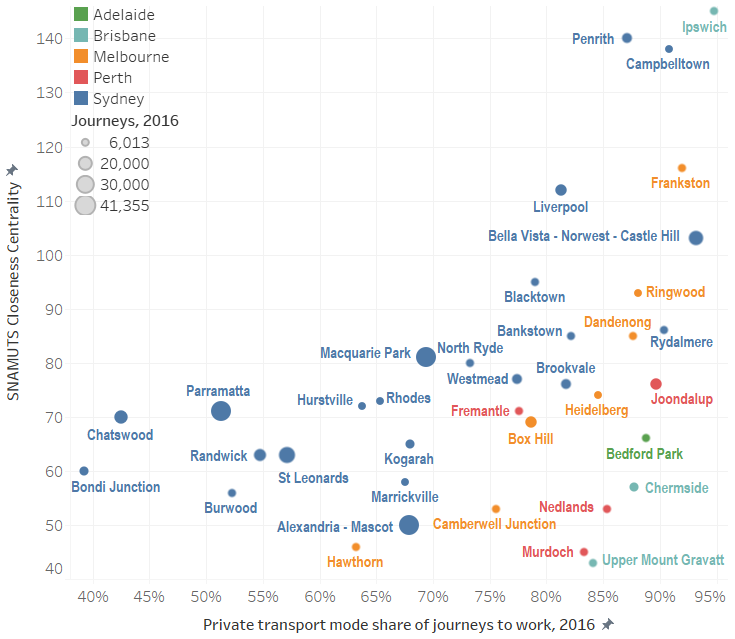 My own hypothesis is that highly job-dense suburban clusters of any size can only emerge after there’s been strong planning intervention to boost non-car transport access and mode shares, as has happened one way or another in Sydney. The case of Heidelberg may be the exception that proves the rule here. It’s highly job-dense and also highly car-dependent, and I suspect manages this only by being relatively small (and benefiting from a lot of public expenditure in support of its car dependence). It will face significant challenges should it grow much further. 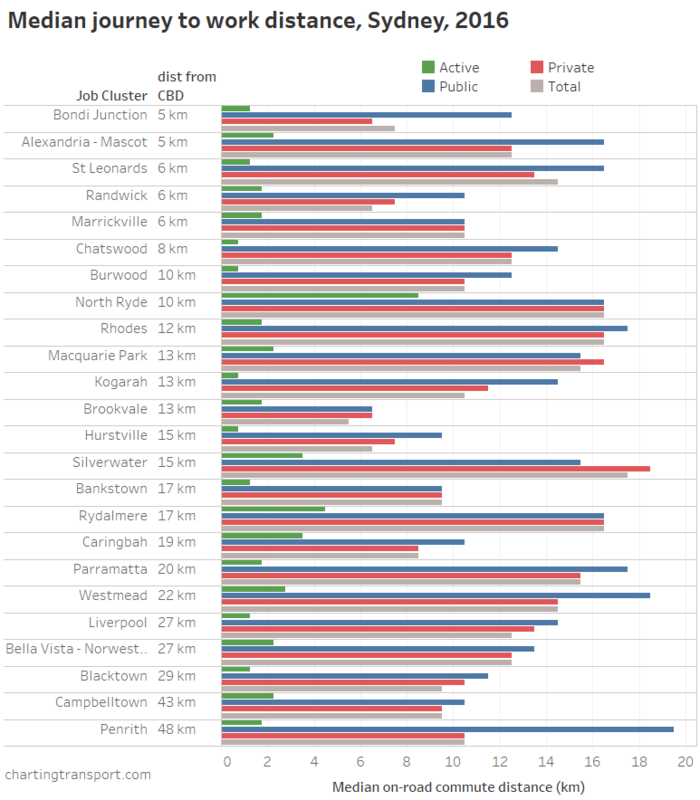 The top clusters for PT and active transport use seem manly to be Sydney clusters were there is a parking levy. 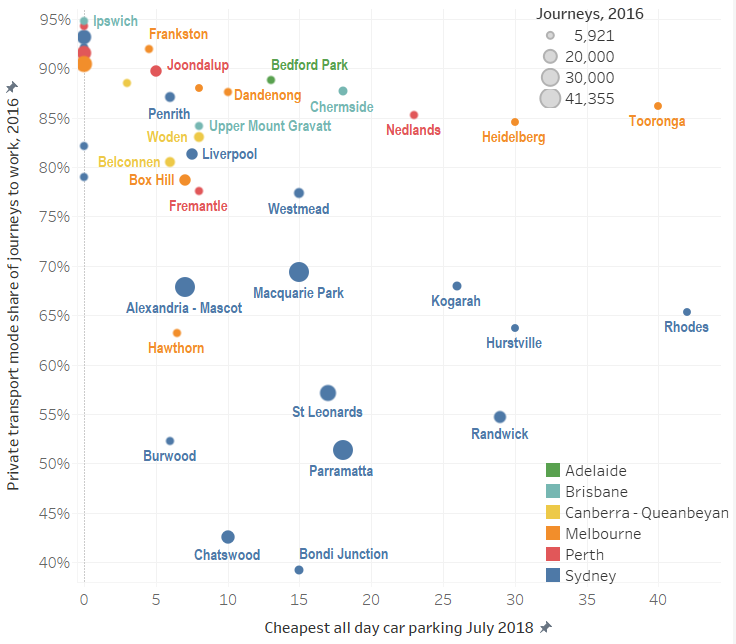 If parking levies were used more widely, there would be more PT and active transport use. 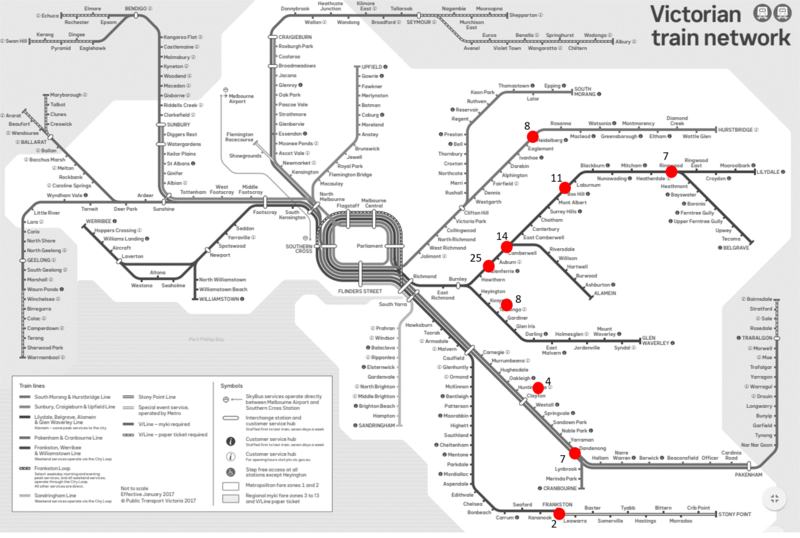 Employment clusters on the rail networks would be particularly suitable for this, especially those closer to the city. 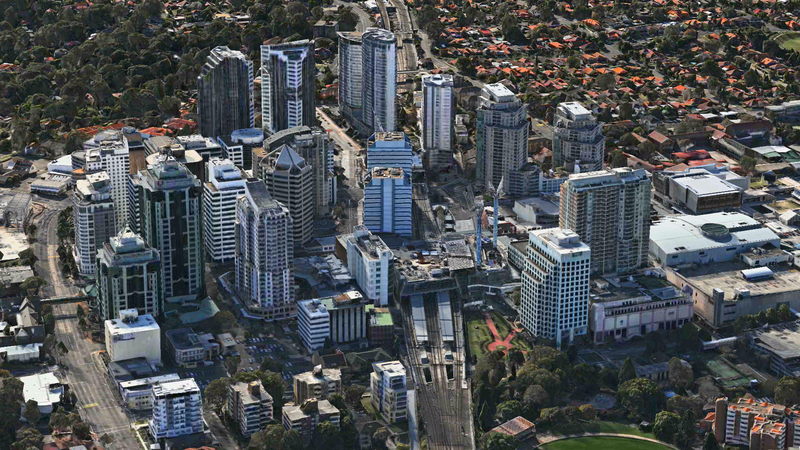 Parking levies apply in Bondi Junction, Parramatta, St Leonards and Chatswood. 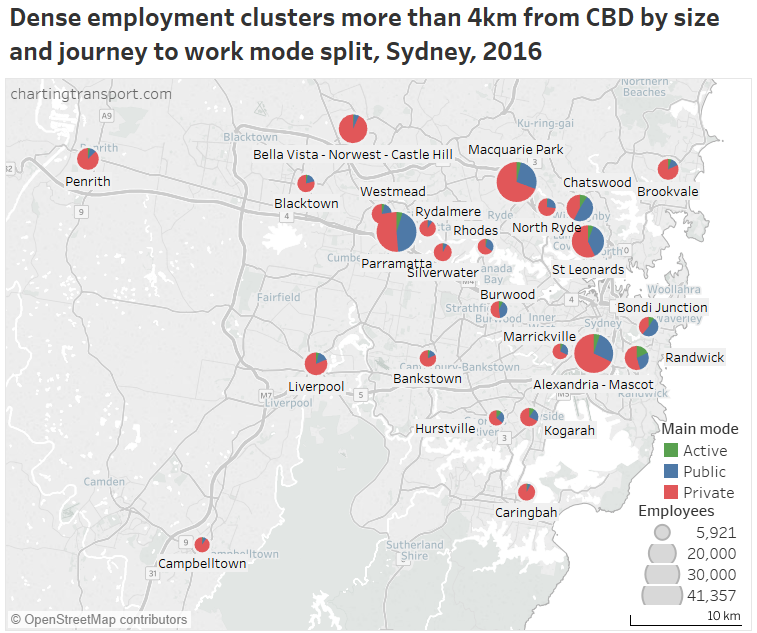 These four clusters were the densest in Sydney are were certainly in the bottom six clusters for private transport mode share. I suspect that parking levies may have a closer relationship with employee parking prices than public parking prices by significantly reducing the availability of free employee parking and also reducing the construction of spaces, especially those built as part of office buildings. 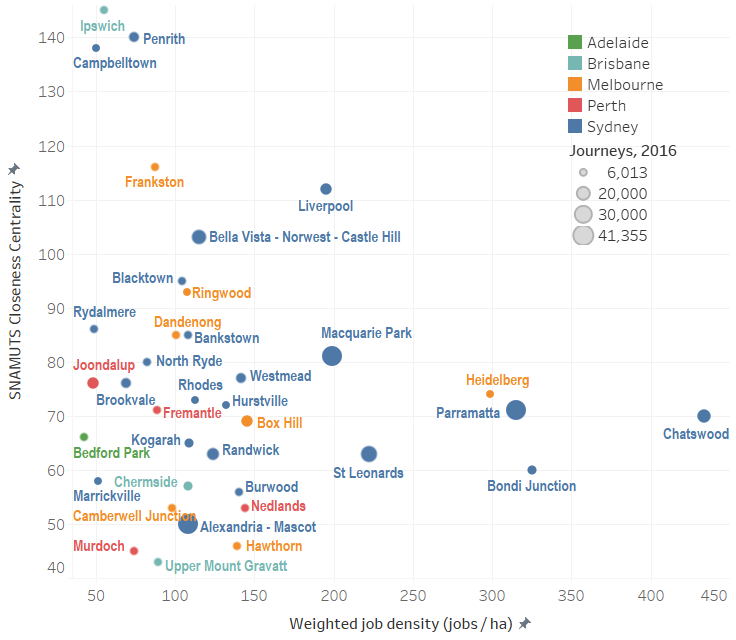 Another interesting thing about these suburban employment clusters in Sydney is that they’re not just for employment, a big chunk of these centres is also home to shopping centres. Macquarie Park has Macquarie Centre, Chatswood has Westfield Chatswood and Chatswood Chase, Bondi Junction has Westfield Bondi Junction, Parramatta has Westfield Parramatta, Blacktown has Westpoint, Liverpool has Westfield Liverpool, Hurstville has Westfield Hurstville, Bankstown has Bankstown Central, Campbelltown has Macarthur Square and Campbelltown Mall, Rhodes has Waterside (which also has an Ikea), Brookvale has Warringah Mall, Burwood has Westfield Burwood and Randwick’s one is pretty small but Royal Randwick is there. 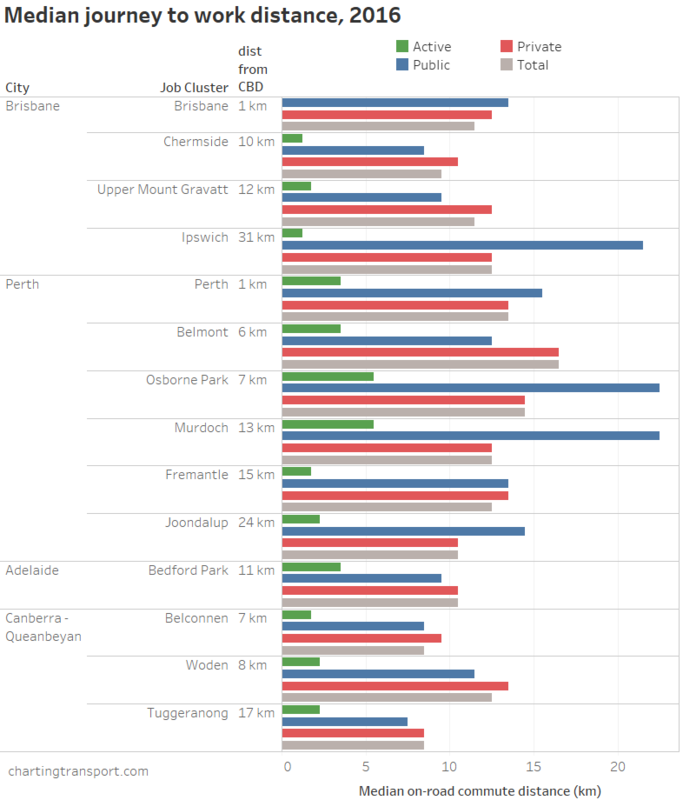 I wonder if the employment clusters (in this list at least) in other Australian cities are also home to shopping centres that are within the cluster, I could be wrong but I’m not aware of any apart from Box Hill, Ringwood and Chermside. 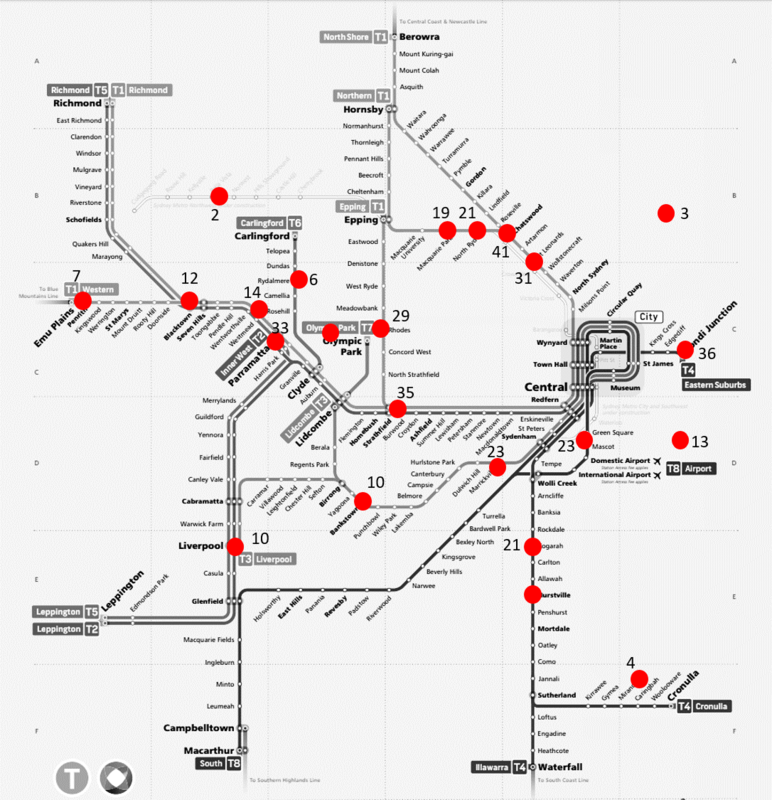 With the exception of Clayton, Melbourne`s clusters have shopping strips and or centres in or just next to them. Clayton is an odd case because it is near several shopping strips and centres but none are actually in it (although there are some food places and a post office in the Monash Clayton Campus). I believe many other cities` suburban clusters have shopping strips and centres in or near them. I think that shopping strips and centres do help attract employment clusters both because they themselves often add to the employment cluster and they make other places of employment in them more attractive to workers by creating eating, shopping, services and leisure opportunities for lunchtime and before and after work with reduced hassle. 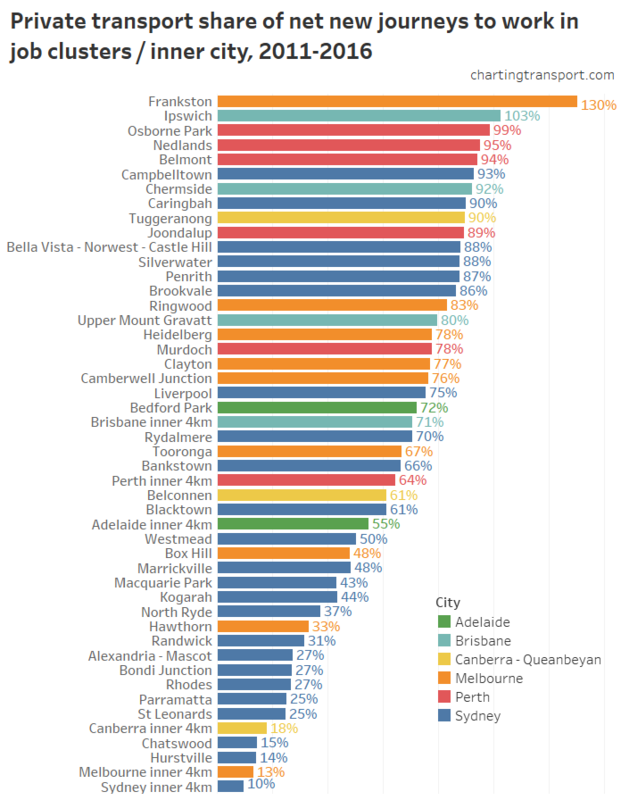 Few clusters are dominated by retail / food (Tooronga is an anomaly because it includes the Coles Headquarters). You can however see some clusters dominated by health care and social assistance. 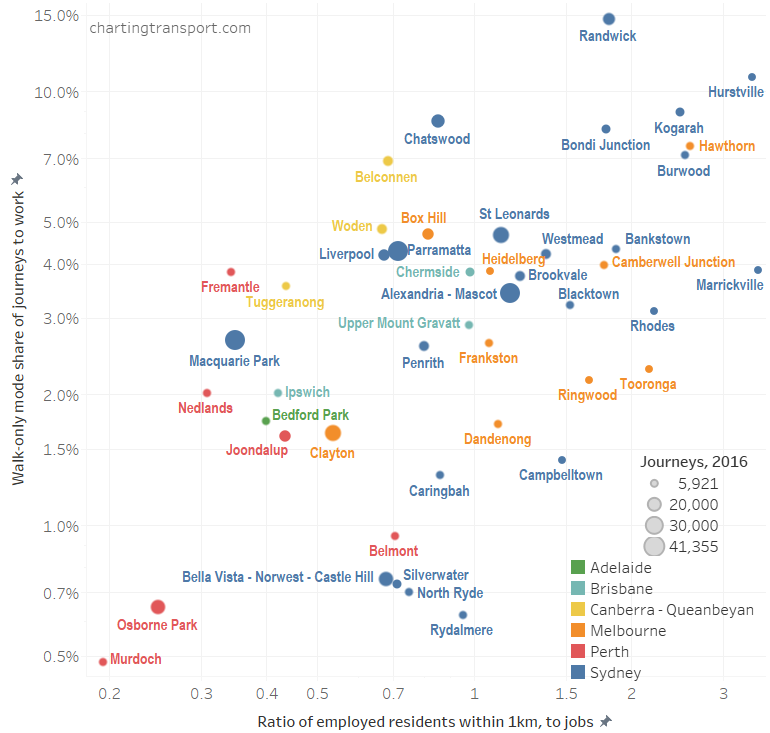 You can also see the Canberra clusters with significant “public administration and safety” sectors (government department headquarters). 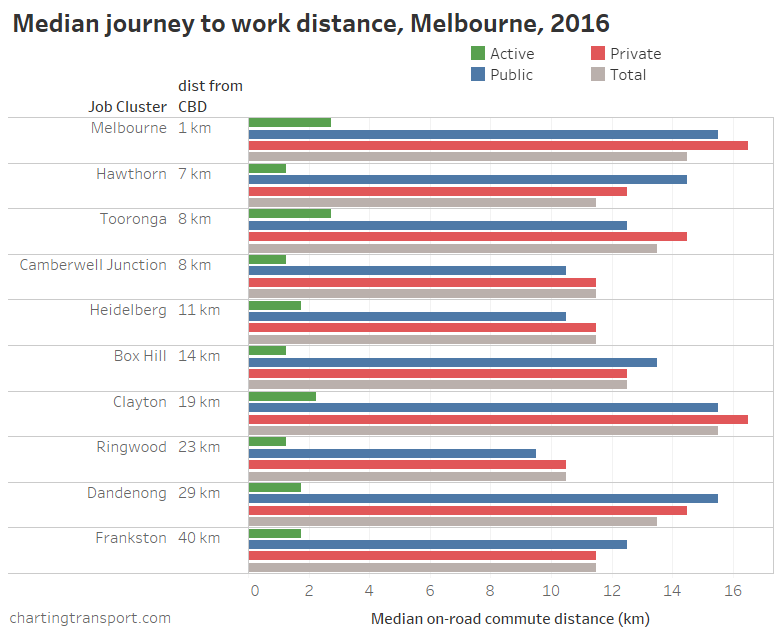 Note the Clayton cluster should ideally include the hospital precinct (5,180 commuters on top of the 29,109 other commuters in 2016, which change its make up a fair bit. Plus a new hospital has opened since the 2016 census. While few clusters are dominated by retain, most of them have a significant retail component. 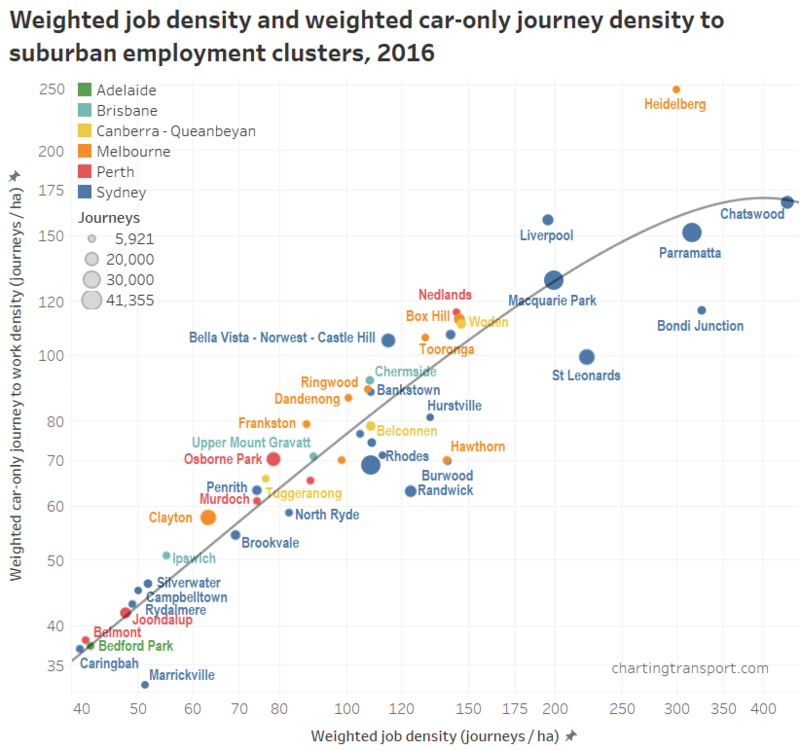 Heidelberg also has retail but it is on the other side of the railway line, mainly along Burgundy St (https://public.tableau.com/profile/chris.loader#!/vizhome/Censusjourneytoworkbydestinationzone/Jobdensitymap says 1,841 jobs in that area). Excellent article thank you. 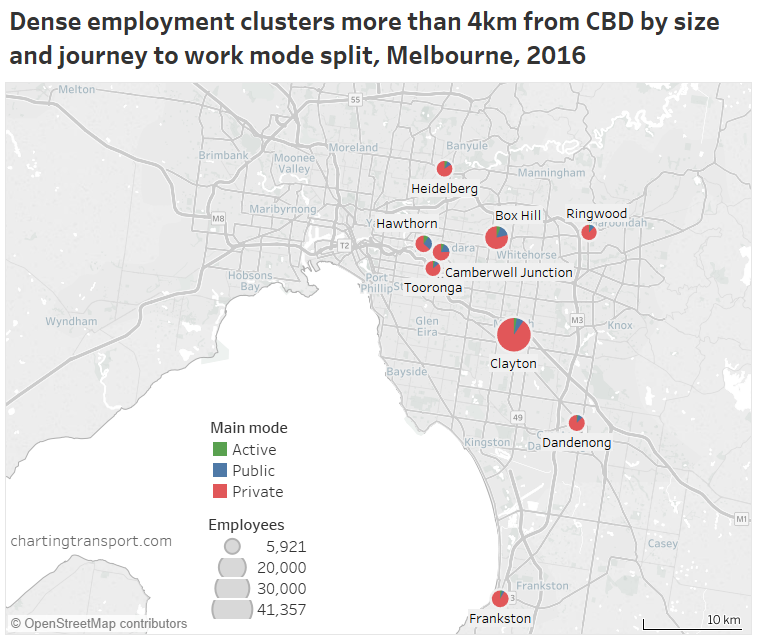 One further dimension that would be useful is revealing the types of jobs and their locational preference: the CBD is not suited to many types of jobs (ie fast growing health and education) while these may be more suited to suburban clusters. All jobs are not the same. Lawyers like their CBD digs. Health workers need their suburban centres. Really useful work – as usual. 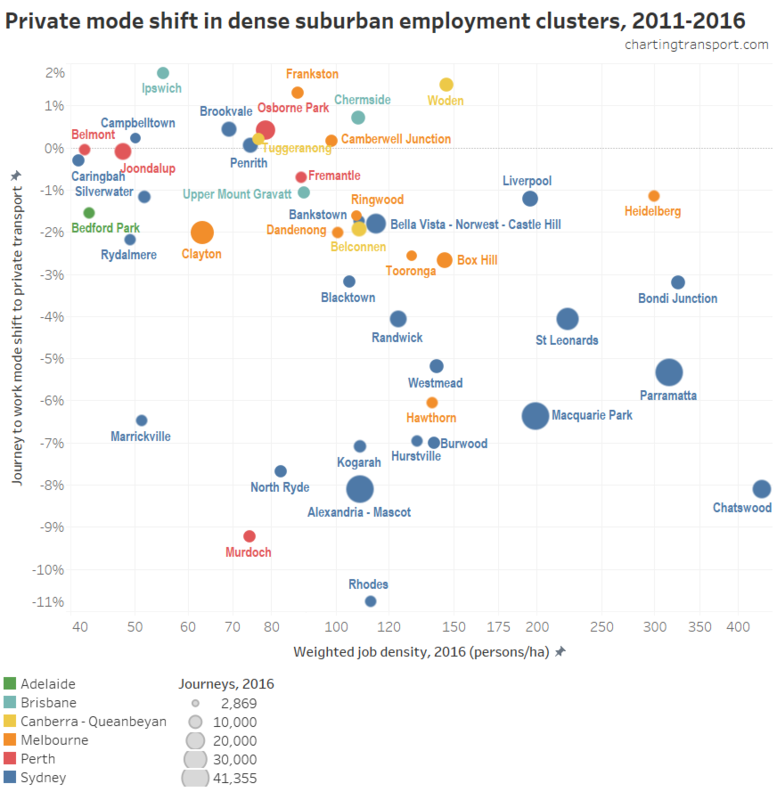 At what point do the cposts of investment and employment in the central city begin to push up rates of (well-located) suburban employment growth? Will the capcity be there?